Among the lesser known, yet most influential leaders of the Muslim Brotherhood organization is the Egyptian-born British national Ahmed Ibrahim Munir Mustafa. Known simply as Ibrahim Munir, he is the global Brotherhood's secretary general and interim supreme guide. The Brotherhood faces a great succession dilemma with many of its Egyptian leadership jailed and facing trials. A controversial old Islamic jurisprudence fatwa states that captured men or prisoners of wars cannot lead their nation or groups. Accordingly, incumbent Supreme Guide Mohamed Badie cannot lead the group while he is in an Egyptian prison. Several names were mentioned as a possible new supreme guide, among them Mahmoud Ezzat, a leading Brotherhood member since the 1960s, who is believed to be in hiding in Gaza and is wanted by Egyptian authorities for allegedly orchestrating the violence taking place in Egypt. But Ezzat announced in 2016 that he did not want the title and recommended Ibrahim Munir. But group members and leaders in Egypt question the 80-year-old Munir's leadership abilities as they fight against the Egyptian state and wish to substitute him with a wartime general guide. Younger members who followed the late Brotherhood leader Mohamed Kamal indicated their desire for a more vicious supreme guide. While the Muslim Brotherhood leadership tried to keep the news of the succession war a secret, the divisions and resignations have rocked the group and shattered any image of unity. Among his Brotherhood duties, Ibrahim Munir supervises the content of IkwhanWeb, the group's English-language website, and its weekly journal Risalat al-Ikhwan. English-language statements tend to be much more sanitized and tolerant than what the Brotherhood tells its Arabic-speaking audience. Munir followed the taqqiya principal – a precautionary concealment or denial of religious belief and practice in the face of persecution – in all his English language communications with the media and United Kingdom politicians. The Brotherhood is a Sunni movement with a Salafist tradition, while taqqiya remains a practice found in the Shiite denomination of Islam. For example, Munir told a British Parliament committee that sharia laws tolerate apostates, but that statement contradicts the beliefs and teachings of Brotherhood founder Hassan al-Banna. It also avoided answering questions about the Brotherhood's positions toward minorities such as homosexuals. An example of the Brotherhood's dual messaging came in September 2012 when a group of Islamists led by the Muslim Brotherhood stormed the American Embassy to protest what was dubbed as an anti-Islamic movie. In Arabic, they called upon all "Egyptians to rise to defend the Prophet" in a million-man march directed towards U.S. Embassy in Cairo. Munir's London-based IkhwanWeb, on the other hand, tweeted a statement from deputy head Khairat Al Shater: "relieved none of @USembassycairo staff were harmed," while expressing hopes that Egyptian-American relations could weather the storm. However, the U.S. Embassy in Cairo twitter account mocked the tweet in English: "Thanks, by the way, have you checked your own Arabic feeds? I hope you know we read those too." Ibrahim Munir meets in London last July with Ayatollah Khamenei's personal representative Mohsen Araki. Despite their following different religious denominations the Muslim Brotherhood and Iran have had relations for decades, as many Brotherhood leaders frequently visit Iran as guests of the regime. The first meeting between Brotherhood founder Hassan al-Banna and Ayatollah Khomeini, the supreme leader of the Islamic revolution took place in 1945 – more than three decades before the 1979 Islamic revolution. Moreover, the only time an Iranian president visited Egypt after the revolution came during Mohamed Morsi's ill-fated one-year reign in 2013 when Mahmoud Ahmedinejad traveled to Egypt. Munir, along with other Brotherhood officials, have maintained strong ties with Iranian leaders. 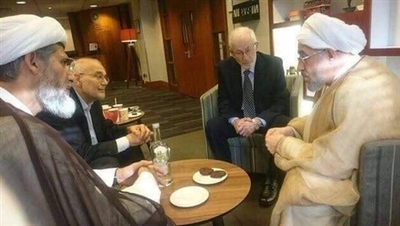 During a July conference on Islamophobia, Munir was among Brotherhood members to meet in London with Ayatollah Ali Khamenei's personal representative, Mohsen Araki. During the 1960s, Munir was part of a terrorist group led by Brotherhood ideologue Sayyid Qutb. Munir was sentenced to 10 years in a maximum security prison as a result. He remains loyal to Qutb, who advocated violent jihad and the toppling of what he considered "apostate" regimes. In a lengthy essay last year, Munir called Qutb a "humanitarian teacher." As with many Islamists in the past five decades, Munir applied for political asylum in the United Kingdom, citing political persecution in Egypt. From his safe haven in London, he established, along with defector former member Kamal Al Hilbawy, the Muslim Brotherhood's international base in 1982. The organization established a network that extended across the globe using London as a political and financial center. From his office in London's Cricklewood Broadway neighborhood, Munir established a web of connections using his diplomatic skills and contacts in the British government. He was instrumental in keeping the Muslim Brotherhood from being banned in the United Kingdom in 2014 after then-Prime Minister David Cameron ordered an investigation into the Brotherhood's activities in Britain and Egypt. The investigation was prompted by terrorist attacks in Egypt that were orchestrated by the Muslim Brotherhood after the June 2013 ouster of President Mohamed Morsi. Munir issued an indirect threat to the British government that terrorism will increase if the ban goes in effect. "This would make a lot of people in Muslim communities think that 'peaceful' Muslim Brotherhood values . . . didn't work and now they are designated a terrorist group, which would make the doors open for all options," he said. Asked if that might include violence, he replied, "Any possibility." 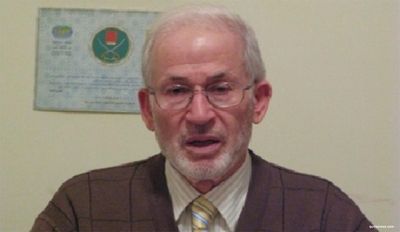 Munir helped saved the Muslim Brotherhood from a terrorist designation by lobbying Britain's Foreign Affairs Select Committee, headed by British MP Crispin Blunt, to release a counter report criticizing Jenkins', neglecting the clear condemnation of the group's activities in UK found in Sir John Jenkins's 2014 report. "Their public narrative – notably in the West - emphasised engagement not violence. But there have been significant differences between Muslim Brotherhood communications in English and Arabic," the report said. "Aspects of Muslim Brotherhood ideology and tactics, in this country and overseas, are contrary to our values and have been contrary to our national interests and our national security," it added. Munir defended Hamas terrorism as self-defense during an unaired June interview with NBC. "I don't just support Hamas," he said, "I support the Palestinian cause, that conflict was created by the West and they have to resolve it or the conflict will continue indefinitely; if Hamas violates the UN articles and Geneva Accords we will condemn them but the West should tell us how else can the Palestinians acquire their rights." Undoubtedly, without Britain's hosting and granting of political asylum and citizenship to its leaders throughout the past six decades, the Brotherhood would have lost access to international media outlets and financial means, and might have disbanded by now. Munir and his colleagues managed to keep the ship afloat through its international base, aided by Islamic charities such as the Takaful Trust and now-defunct Human Relief International. These fronts financed multiple media outlets including a TV network originating from Turkey after June 2013 which became the launching pad for Brotherhood propaganda and incitement of violence in Egypt. Moreover, the Brotherhood convinced the British authorities repeatedly of its so-called peaceful nature. They managed through trickery, taqqiya, and shrewd diplomacy to play off British politicians' naiveté' to keep their UK operations intact. Ibrahim Munir may not be a household name but he remains the Brotherhood's gatekeeper and its savior in dire situations. His good-cop attitude with the British media and political circles, along with shrewd financial and media skills, has managed to protect the group from attempts to ban it. Hany Ghoraba is an Egyptian writer, political and counter-terrorism analyst at Al Ahram Weekly, author of Egypt's Arab Spring: The Long and Winding Road to Democracy and a regular contributor to the BBC.